Ball joints are a hip like socket that allow the front wheels of a car to move up and down protecting the car’s suspension and steering against road bumps. They attach the control arm to the steering knuckles. 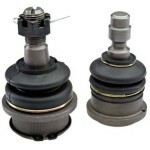 Ball joints consists of a steel bearing stud and socket enclosed in a steel casing. The bearing stud fits into a tapered hole in the steering knuckle. A rubber boot cover protects from dirt and houses grease to reduce wear. The internal spring holds control balls that prevent vibration. When a ball joint loosens up, the joint rattles in the socket making a knocking sound from the front of a car over road bumps. If a ball joint tightens up, it stiffens the steering wheel as you turn. Fortunately, our mechanics can easily check your ball joints for excessive wear or seal cracks before you experience severe steering or suspension problems. Whether the ball joints need greasing or replacement, our North Attleborough auto repair technicians have the tools and know-how to keep your car cruising Massachusetts roads.